Next time you order flowers for someone, STOP! “Consider ordering instead an edible arrangement,” says Francine Cazeau, co-owner with husband, Jean, of Edible Arrangements next to the Coffee Bean on South El Camino Real. So, what’s an edible arrangement? Well, it looks like a beautiful flower bouquet, but the colorful blooms consist of freshly cut fruit, not flowers. And for those who like to give or send arresting and memorable gifts, it has become a terrific alternate choice. Prices for the fruit arrangements compare to those of flowers --- from $25 to $200. Most people call ahead and pick up the arrangements themselves. 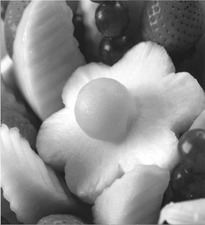 Edible Arrangements takes same day orders and delivers to Dana Point, San Juan Capistrano and occasionally to Oceanside. “We get fresh fruit delivered here by our produce firm every morning after placing an order the night before. If we get swamped and run out, we can always rely on the freshness of our local grocery produce department in a pinch,” Francine says. At the time, Francine worked part time at Standard Pacific Homes in Corona and still does, but plans to slowly opt out. Jean is still an elementary school teacher in Anaheim along with working in the store. Before working two years for Standard Pacific, Francine was ten years in the social services field in Corona. Prior to that, she studied psychology at a small college in New York City. After investing in the franchise, they went back to Connecticut for a week’s training and took another week on site in their store. Francine says, “The surprising thing is how challenging it is to have our own business. We’re learning two things at once: How to improve the business and how to juggle business with our family life.” The young couple, Francine, 35, and Jean, 35, have three children ages nine, five and two. “Fortunately, Jean’s mother helps us out with the kids,” Francine adds. The biggest days for Edible Arrangements are the holidays, according to Francine. Reach the store at 492-2002, or www.ediblearrangements.com.